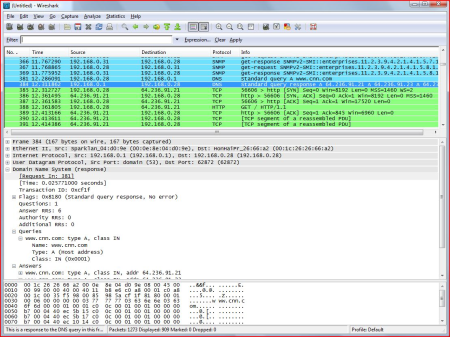 Wireshark is an open source tool for profiling network traffic and analyzing packets. Such a tool is often referred to as a network analyzer, network protocol analyzer or sniffer. Wireshark, formerly known as Ethereal, can be used to examine the details of traffic at a variety of levels ranging from connection-level information to the bits that make up a single packet. Packet capture can provide a network administrator with information about individual packets such as transmit time, source, destination, protocol type and header data. This information can be useful for evaluating security events and troubleshooting network security device issues. Wireshark will typically display information in three panels. The top panel lists frames individually with key data on a single line. Any single frame selected in the top pane is further explained in the tool's middle panel. In this section of the display, Wireshark shows packet details, illustrating how various aspects of the frame can be understood as belonging to the data link layer, network layer, transport layer or application layer. Finally, Wireshark's bottom pane displays the raw frame, with a hexadecimal rendition on the left and the corresponding ASCII values on the right. Wireshark is licensed under the GNU General Public License. What's the difference between packet sniffers and protocol analyzers? The Wireshark website has more information.